Over the past few years, card wallets pretty much exploded based on the increasing demand of many individuals. Not only for storing debit cards or credit cards, many people need a wallet for there member cards, ID cards and even business cards as well. Some card wallets were hot, some were not. Some even come off a tactical gear, money clip or pockets for multi-function. But here at BestWalletReview, two major things we focus on are slimness and application. 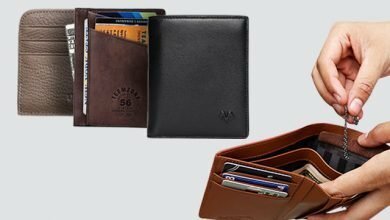 The best card wallets for men should enable to protect your cards both inside and outside, meanwhile need to stay slim to not ruin your tight jeans or trousers. 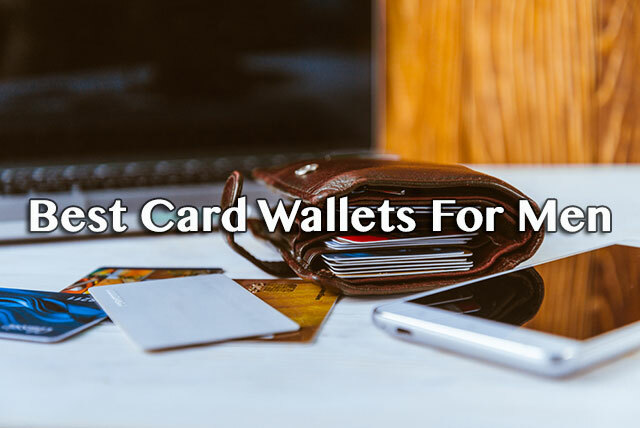 To that end, in no particular order, here are 10 best card wallets that are worth to try at least one in life – in case you’ve missed them. It’s time to say goodbye your old bulky card wallets and hello to a new slimmer one with the similar space for storage that your back pocket will love. 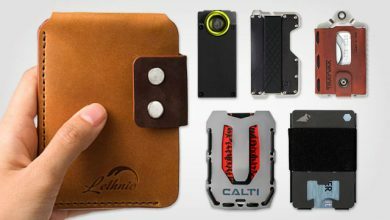 And Lethnic Minimalist Wallet is worth a try! Because it ensures three top requirements for the best card wallets – huge capacity, slim silhouette and security. Other than that, this little buster is compact enough to stay whether it’s your back pocket, front pocket or breast pocket and very cool. Speaking of grungy-look wallet, I think nothing can compete military camouflage pattern. It’s synonymous to power, strength and freedom. On top of that, the combination with small zigzag embossing emphasizes its cool look to extreme. While keeping only 0.7” thick, this wallet comes in 4.4”x3” in dimensions with three customized slots to ensure fitting either cards or bills. But take notice that, it accommodates folded bills only. A sturdy metal button snap is built to compliment the whole design, not only an awesome decorative detail, but also an efficient strap to secure your belongings. On top of that, the built-in RFID Shield is worth mentioning. It helps a lot of keep your bank registration data safe all the time, even hushing across a crowd or going out shopping. Always keeping those illegal scanners at bay! This is an aluminum slim design that stays mostly in any wish list of many people who desire a wallet with sturdy and strong hand-feel whereas remain the best lightweight and slimness. The structure of this wallet can’t be simpler, including two squared pieces measured 3.3 x 2.1 inches made from premium aviation aluminum and 304 stainless steel that are connected by a super flexible elastic band. Thanks to this special construction, it helps to slim down the profile of your traditional wallet to be more concise and sophisticated. However, it still delivers a superb capacity when enable to hold up to 12 cards. 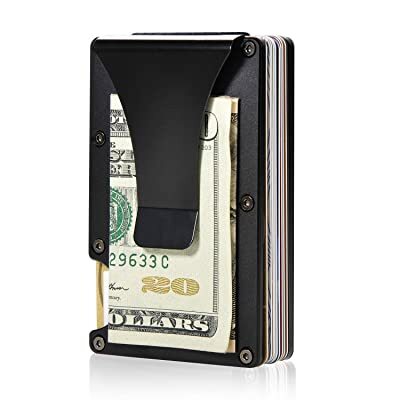 Besides, as we still need some money for quick payment, there is a built-in sturdy money clip that can accommodate up to 6-10 bills whereas keep its shape well. If you are seeking a metal wallet as a present for friend or family member, again, this is a high recommendation because of its elegant and luxury packaging. Ready to swap out that ugly traditional bulky wallet for something that is a little bit cooler for your cards? Here’s my third recommendation for you! This Lethnic wallet has some sort of unique features that you should keep in mind. First up is its colorways, I understand that this is a summer collection so the product line comes in lots of garish shades such as red, pink, blue, yellow and more that I think it’s perfect for those who love being outstanding or attractive. You like to play with colors on your daily outlook and here’s my advice for an elegant yet impressive item to complete that concept. Now, speaking of its functionality, its slimness must be highlighted, which is only roundly 0.3”. It can fit in your front pocket, back pocket and even your chest pocket. However, it still guarantees us the functionality. Unlike some slim wallets that are too small to fit nothing, this one comes up with a perfect compromise of design and function. Not only provide you enough storage space for your everyday carries, it also helps you organize them neatly. There are 4 card slots, 2 slips, 1 ID window, and 1 bill compartment. Besides, this is a perfect wallet for travel thanks to its built-in RIFD Shield to protect your personal information against hi-tech thieves. 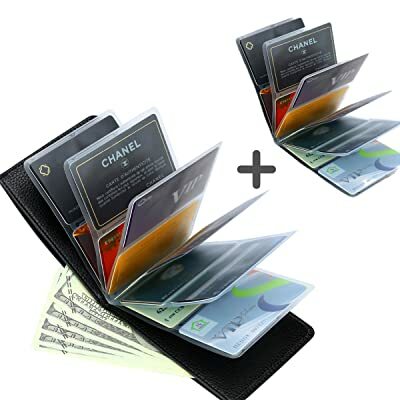 Typically, as slim card wallet becomes slimmer, it usually has tendency to sacrifice both functionality and outer performance. 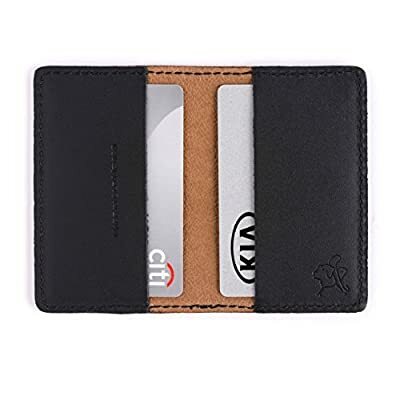 However, when it comes to this Zhoma RFID Blocking Genuine Leather Credit Card Case Holder Security Travel Wallet, it sacrifices neither of them. Measured as 4.5″x 3″x1″, it manages to a slim silhouette that can even stay neatly in the palm of your hand whereas remain a large space to feel substantial. There are 11 card slots each of which can fit up 1-2 cards at the same time or paper money, bills, receipts, checks or whatever you like. It is also well fitted with business cards. It’s a big thank you for the accordion style card compartments to help everything well organized as well as easier to get in or out. And don’t worry, all of your valuables will be secured by a sturdy and high-quality zipper, delivering smooth pulling and entirely closure. Many customers also confirmed that it could last for years. In addition, the manufacturer offers 100 percent money guarantee that covers any detects from producing process. To that end, just feel confident to give it a try! This type of card wallet might be new to you as it’s just developed lately. In generally, it’s like a photo album coming in smaller measurements to fit the card sizes. The whole design is made from plastic. Hence, though it can’t end up with a strong and sturdy silhouette, the wallet does give a highly flexible hand-feel. 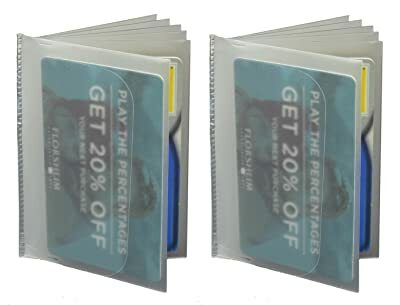 As the material is high quality, it can keep your cards without any problems like tearing or loosening to go to the end of losing your cards. Absolutely a high security card wallet for those who own more than 10 cards. You also can utilize some of their compartments for cash, bills or receipt due to personal preference. There are 6 pages, each of which can hold up to 2 cards in two sides. The dimensions of each compartment are 4 x 2.2 inches, slim enough to stay comfortably in any pocket whereas spacious enough to fit most cards. Not saying that it’s super lightweight because of plastic material, only 05. .8 ounces, that sometimes, you might even not notice of carrying your wallet along. For some more bucks, you can get this MLB Wallet. Okay, it’s actually not like a baseball wallet because the material isn’t made out of the catcher gloves or the baseball like other “baseball wallets”. It’s exactly inspired by the well-known curve of the baseball and see, it’s on the frontside. But the best thing about this feature is you can push cards up for quick access within seconds. Due to that interesting functional detail, I really appreciate this wallet. 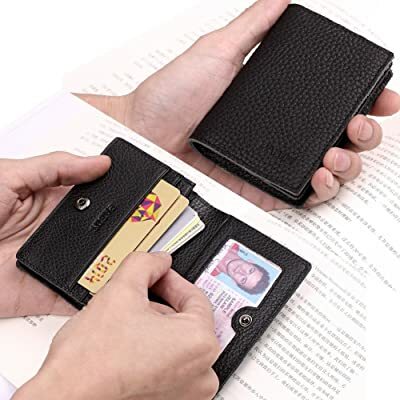 Besides, the decrease of stitches in whole wallet helps it flatten significantly, plus, its sturdy design brings you a clear feeling of its durability and protection. Unlike other slim wallets which are too flimsy to hold its form. This is also synonymous to less security to your belongings under corrosions or beating. Lethnic MLB Baseball wallet isn’t the one. It’s high quality, firm and secure with RFID Blocking Technology to keep your rest assured all the time. One greater bonus is the combo of D-shaped ring and ID window that you can totally take advantage of to be your useful employee ID card holder or school identity card holder or it’s just something to overcome your woolgathering. The briefest description for this design is pull-up card wallet. Why pull up? Because there is a clever pull tab integrated in the major card compartment of this wallet that plays the role of pulling out and showing up all your cards in a clear vision so that you can take which you need, then pull back down the rest ones. This feature is also the biggest advantage of this wallet, very convenient and fast. This card compartment includes 8 small slots for 8 cards, which I think it fits for those who love carrying less. 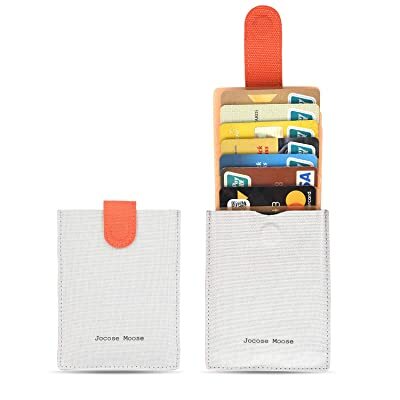 To keep those cards in place without accidentally falling out, the wallet is attached a magnetic strap which has been received many compliments for its closure and high durability. Just keep ease in mind, it can serve you for years. On the other hand, there is also a small pocket in the back for folded bills, money or receipts as well. FIDELO Minimalist Wallets for Men is front pocket carry the way it is figured to be – sturdy, firm, slim, hard and lightweight. Compared to the Aluminum Slim Wallet from Lookiss, this one is sturdier and its elastic band is more flexible to offer better capacity. In fact, it can hold up to 15 cards including RFID-enabled cards, bank cards, ID cards, business cards, etc. Besides, it also allows you to bring some more cash along. 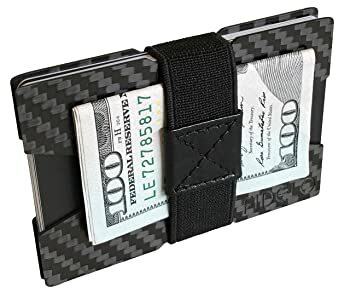 The biggest advantage of this wallet is the premium grade carbon fiber material which is stronger than steel, especially during after years using, the outer performance doesn’t appear scratches at all. But don’t worry about it getting hard to slide your cards in and out. Easily, just push out the cards, then squeeze plates to fan them out and pick you desired one. Another advance of this wallet is that there are two designs: one with squared corners and the other with curved corners. 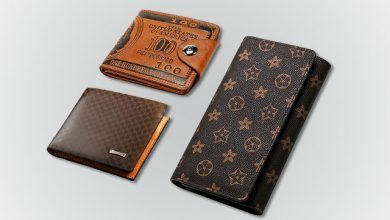 This album-styled card wallet is similar to the Marshal design above. However, the good thing about this one is its outer performance polishing which is now fitted to those people who need a good design wallet to show up their class and subtle look every time pulling out their companion. 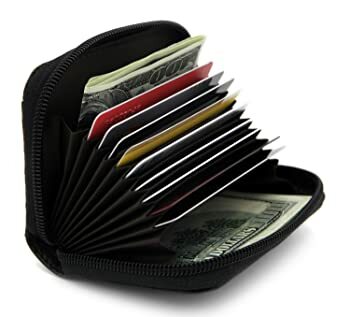 This Wonder Wallet is covered by 100 percent top grain genuine leather on the outside whereas going inside, there are 24 card slots splitting into 6 plastics “pages”. Unstoppably, there is a full-length compartment where you can keep some more paper money, bills or receipts due to personal preference. What is worth mentioning the most here is its capacity contrasting to its dimensions. 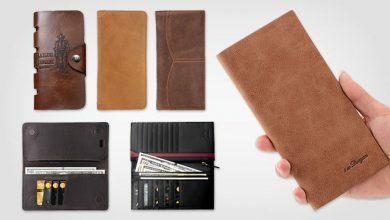 With the same space for stuff, however, this wallet comes off 3 times slimmer than the traditional design. In another word, it can fit any pocket without boasting your trouser or tight jeans. One more good thing is its RFID Blocking Technology that enables to prevent any unknown scans in 13.56 MHz Frequency. But, please take notice that with 125 KHz Frequency, it is unable so that if you want extra protection for your hotel access card or RFID badges, just add some RFID Blocking cards on the outside. I really appreciate this innovative design as it takes both role of a slim wallet to carry along your everyday essentials and a key chain holder to help you easily figure out where your keys are. It’s like killing two birds with one stone. Not saying that the wallet itself is designed cleverly to be spacious enough to fit up 10 cards and some cash comfortably whereas compact enough to not cause any bulk. 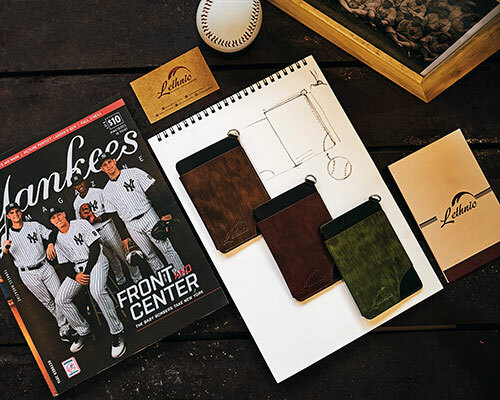 Besides, you needn’t to worry about its durability as the wallet is made completely from high-end full grain leather handcrafted by the best artisans. Not only is it durable, but also the wallet delivers a subtle and luxury look. It is guaranteed by the manufacturer to cover any detects from producing process as well. Another advance is its smart pull tab for quick access your cards. Meanwhile, it’s easy to operate. 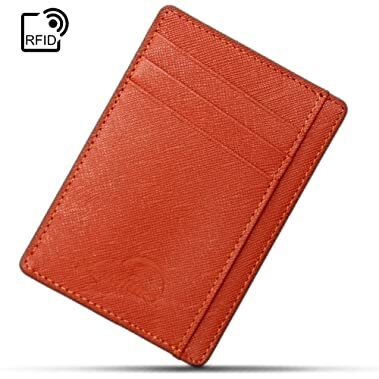 As this is a cardholder, there is built-in RFID Shield to ensure your private information stay safe as always. Another compact card wallet for those who love carrying small. This design comes off 4 x 3 inches, which can stay neatly in the palm of your hand while also offering the moderate space for your stuff and secure enough to protect them from outer impacts. In terms of the inner construction, there are 3 separated credit card slots, 1 space for about 20 cards and 1 clear window for ID/ Driving License. After being fulfilled, the maximum thickness of this wallet is only roughly 0.5 inch, still slim enough to stay in any pocket without burden. Wonder about its material? This design is made from premium leather and you know what is the best thing about it? Durability! This feature has been proved by many customers saying that it can last for years. In addition, its unique and soft texture also releases a luxury and vintage look as well. A wallet will surely show up your fashion and personality sense! Last but not least, it is equipped with the latest RFID Blocking material for the best protection against hi-tech thieves. Elegant, subtle, luxury, spacious and security, there is no reason to deny trying such wonderful wallet! 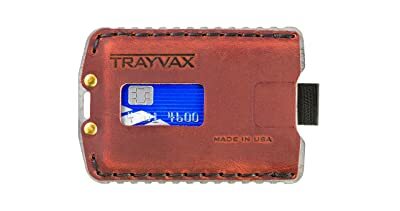 The next in this collection will be a brand-new product from Trayvax who is already well-known for their bolding tactical wallets. I must say that this design is a great combination between the incredible softness of genuine leather and the strength of metal. The whole surface is really comfortable touch whereas it remains its shape very well to deliver the best protection for your cards. Because this is a minimalist wallet, its general structure is quite simple yet convenient. There is one big compartment for 5-6 cards and another smaller for some cash (maybe 5-6 bills). Take a look more in depth at the card compartment, there is a smart pull tab as well as a finger glide strap to help you easily get you cards in and outs. 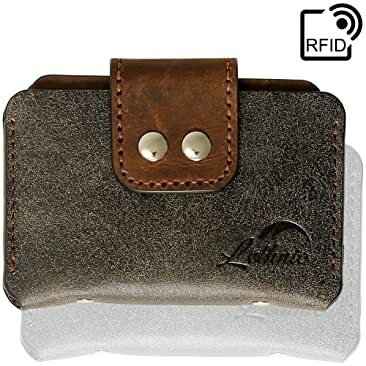 Though this is also an RFID wallet, please bear on mind to hide the RFID chip of your cards inside without exposing out through the finger glide strap for the ultimate security. Before digging deeply into this wallet, let’s take a look at its guarantee – 100-year warranty. Wow! How on Earth there is such incredible warranty on their product’s craftmanship and material like this! Honestly, because of such impressive warranty, I was hooked to this wallet and it’s no regret. The product is actually good with the cow leather well selected from the most durable, most expensive and the highest grade. Right from the very first touch, it gives a totally different experience from the other ones. An entirely soft, smooth and luxury look and feel. It’s hard to put thoughts into words, but when hands on this wallet, it will leverage you to a higher class. Not saying that the material gets better, more durable and beautiful with ages. Particularly, it is lined with soft but tough pigskin as well as stitched with marine-grade polyester thread, which is all handmade by the most professional artisans to commit the highest durability. But here is the real fun begin, there are only two inner compartments and though it might take several weeks for breaking in, once the leather is worn in, the wallet can accommodate up to 16 cards, which means 8 on each side, impressively! To make it perfect, the manufacturer hasn’t forgot to equip RFID Blocking material to prevent your personal data from hi-tech thieves. Contemporarily, I have no complaint for this design! it’s worth a try! 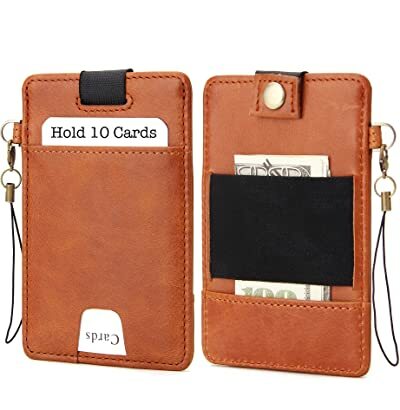 Though these ten card holder wallets end up with different styles and designs, there is one and foremost similarity is that they all come in reliable brands to release high-quality material and good warranty. Hence, in case you don’t find it is suitable for you, you can return it to the manufacturer. Moreover, hope that this article is helpful for you. Good luck!